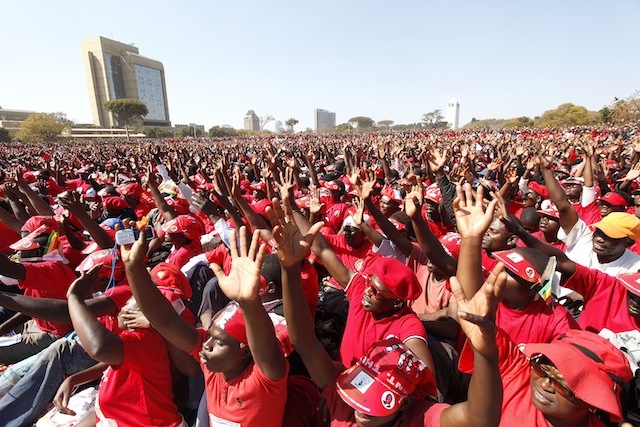 HARARE, Jul 30 2013 (IPS) - At a recent campaign rally in Zimbabwe’s Midlands Province, Prime Minister Morgan Tsvangirai pledged to establish rural-based companies to create employment. It was a promise that appealed to 34-year-old sociologist Agnes Ngwenya who graduated from the University of Zimbabwe 10 years ago, but has not yet found work. She broke into song and ecstatic ululation, as she jumped and gyrated with optimism, waving a red flag – a distinctive trademark of the Movement for Democratic Change – Tsvangirai (MDC–T). 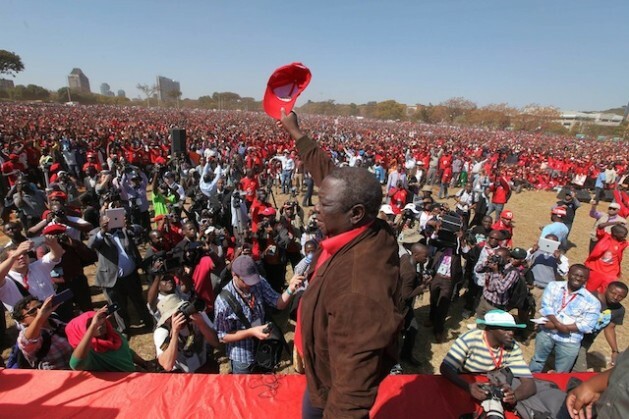 MDC–T promises to create a 100-billion-dollar economy by 2018, anchored by foreign direct investment. Meanwhile the splinter MDC–Ncube, led by Professor Welshman Ncube, pins its campaign on devolution, or decentralising governance. “Believing that the Zimbabwe Africa National Union-Patriotic Front (Zanu–PF) 2013 campaign manifesto will one day transform the lives of many suffering Zimbabweans after the party’s three decades in power is a definite impossibility and absolutely untrue,” Ngwenya tells IPS. Zimbabweans go to the polls on Wednesday Jul. 31, amid reports of intimidation, threats of violence and abductions. But economists here say that it does not matter whether Tsvangirai’s MDC–T or President Robert Mugabe’s Zanu–PF wins the election, neither will be able to reverse Zimbabwe’s economic meltdown anytime soon. Economist Kingston Nyakurukwa says that both parties have unrealistic plans for solving Zimbabwe’s economic problems. “While I agree that MDC–T seems to have a better plan to rescue the country from a decade-long economic crisis, generally manifestos pencilled by the parties set to lock horns at this years’ elections are unrealistic, exaggerated and reflect the ambitiousness of the parties racing to govern this country rather than the pragmatic means to arrest the country’s economic woes,” Nyakurukwa tells IPS. Between 2003 and 2009, this Southern African nation’s year on year inflation was reported as 231 percent. The Reserve Bank of Zimbabwe was forced to issue a 100 trillion Zimbabwean dollar note and eventually the central bank stopped printing money in 2009, opting to adopt a multi-currency regime. Not only that, unemployment is ridiculously high. A 2009 report by the United Nations Office for the Coordination of Humanitarian Affairs stated that the country’s unemployment rate was 94 percent. A great majority now work in the informal sector. Much of the country’s economic meltdown has been blamed on Mugabe’s policies, which include a controversial land reform programme that began in 2000 and saw over 300,000 people forcefully occupy land previously owned by an estimated 4,000 white commercial farmers. Another controversial policy area is foreign investment. Though for 21-year-old Evelyn Chatsi from Mwenezi district, about 144km southwest of Zimbabwe’s oldest town of Masvingo, it is not controversial at all. She feels it is a solution for her improved economic future. “I know Zanu–PF will not betray young people. The party crafted the indigenisation policy to empower youths like us and come Jul. 31, our lives will be changed, with President Robert Mugabe back at the helm of leadership,” Chatsi tells IPS. Under the Indigenisation and Economic Empowerment Act of 2007, foreign-owned companies are required to sell a 51 percent stake to locals to stimulate economic growth. But some financers fear losing their investments through this policy. Independent economic analyst John Robertson says it has scared away investors and led to several companies closing down after being taken over by locals. “With indigenisation, we have attracted very little new investments here and caused closure of several companies that offered employment to many people here,” Robertson tells IPS. According to the Consumer Council of Zimbabwe, 85 companies closed down in Harare last year and over 100 shut down in Bulawayo between 2009 and 2013. “While MDC-T’s manifesto is reasonable, [it is] too ambitious, which may also be difficult to implement. The political parties want power; they don’t mean what they say,” he tells IPS. Charles Msipa, president of the Confederation of Zimbabwe Industry, says Zimbabwe really needs a government with a consistent policy framework that addresses the country’s economic opportunities and challenges. “But whether that policy environment is delivered by a coalition or single-party government, it’s for the electorate to decide,” Msipa tells IPS. However, the Zimbabwe National Chamber of Commerce president Davison Norupiri says another coalition government would stifle economic growth. After the violence that followed Zimbabwe’s disputed 2008 election, Zanu–PF and MDC–T signed a pact to form a government of national unity with elections this year. “We strongly believe that we no longer need a government of national unity, because it hampers our economic growth. With our [unity government] here, we haven’t moved much in terms of economic development,” Norupiri tells IPS. Mike Milton, who runs a plastics manufacturing company in Harare, is also not sure that either party has a concrete solution to save the economy. “Both MDC-T and Zanu-PF election manifestos lack pragmatic means to arrest the country’s decade long economic woes. They are not clear on how they aim to practically restore investor confidence,” Milton tells IPS. “But if we have another disputed election, another coalition government may be unwelcome, which will throw this country into a serious and irretrievable economic morass,” he says. But Prosper Chitambara, an economist with the Labour and Economic Development Research Institute Zimbabwe, an independent economic research think tank, says he doubts that Zanu–PF’s manifesto would yield any positive changes if the party won the elections. “In its manifesto, Zanu-PF carries the same old story and I don’t think they will change the way they have been doing things for the past [three decades] even if they may win this election. What they are saying in their campaign manifesto only helps to weaken the value of the national assets and in this case, Zanu-PF’s manifesto is more ambitious than the MDC-T one,” Chitambara tells IPS. “But I think under an MDC government, we shall see numerous positive transformations and developments hence people have so much expectations,” says Chitambara. An African Union election observer speaking to IPS in Harare on condition of anonymity says political uncertainty has been the biggest factor in crippling Zimbabwe’s bid to grow its economy.